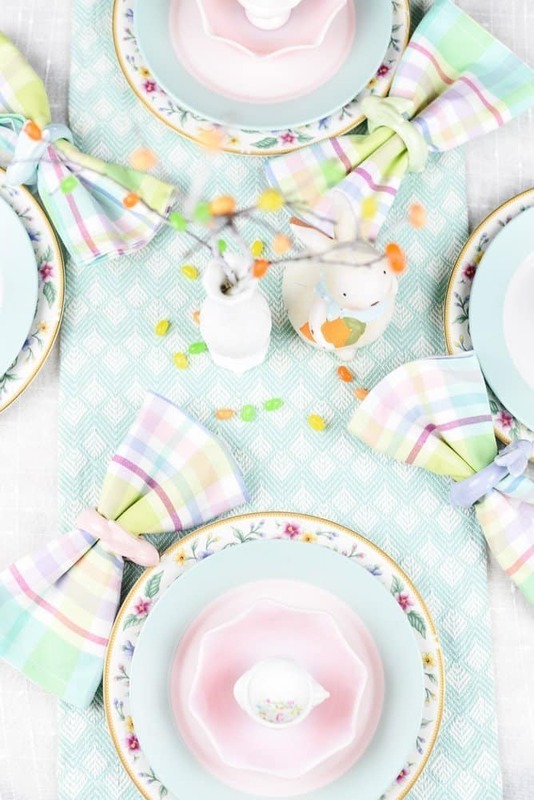 This post, How to Create an Easy Pastel Spring Tablescape, contains affiliate links. If you click on a link and make a purchase, I’ll get a little extra change in my pocket at no additional cost to you. Be sure and check out all the beautiful spring tablescapes at the end of this post. Hello, Spring! I’ve been waiting and watching for you. OK – technically it’s not Spring yet, but you get my drift. 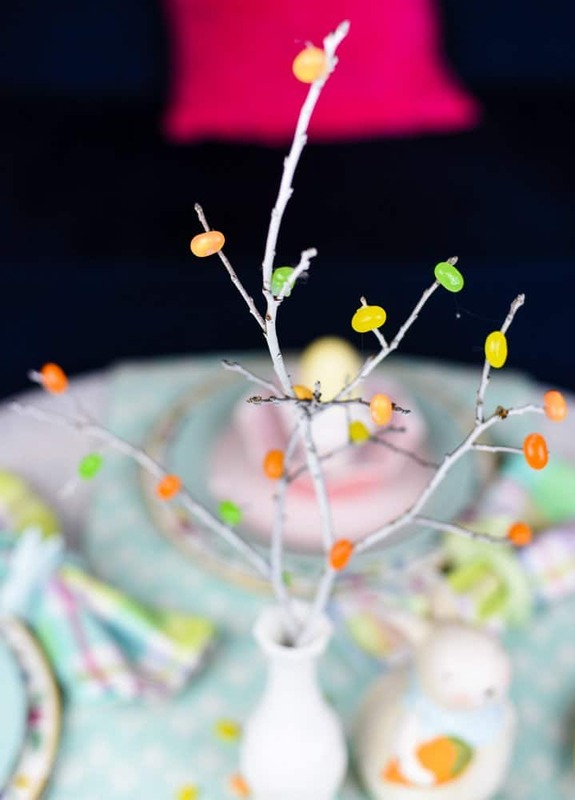 Spring is knocking at my southern door and that means Easter is right around the corner, so I’ve created an Easy Pastel Spring Tablescape that is practically free because I’ve been decluttering and I refuse to buy anything new at this time. I’m crazy about dishes. If I didn’t control myself, I’d have different colors and patterns of dishes stacked all over my house. I can almost see myself on an episode of hoarders but with stacks and stacks of dishes. Since I’m also trying to become more of a minimalist, I have to restrain myself. Plus, I have sets of china/dishes that I’ve inherited from my grandma, my mom, and my aunt. And every time I use any of these dishes, it takes me back to my childhood and all those feel-good memories that come with. 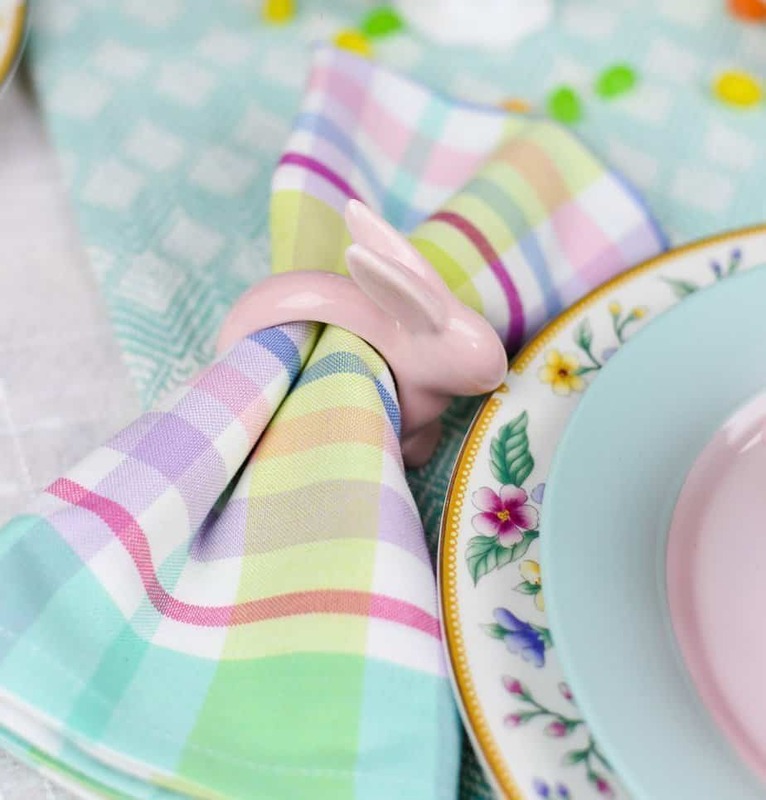 When it comes to setting my spring table, I tend to lean towards pastels. By now, I’m tired of dark, winter days and I want light and airy. A few nights ago, right in the middle of halftime of my favorite college basketball team (Go, Duke), I decided to come up with a pastel tablescape using dishes I had on hand. The bottom plates are part of a collection my aunt gave me several years ago. The middle plates are from Stein Mart. It was one of those days that I couldn’t restrain myself. So there. The pink bowls are handed down from my mom. The egg cups are from Amazon and I’ve had them several years. I couldn’t find the exact ones that I have, but I like these pastel egg cups even better. I almost made my own table runner, but then I found this one on Amazon and it was too pretty and too inexpensive ($14.99) to pass up. Plus, it goes well with my easy pastel spring tablescape. I have a huge dining room table (seats 14) because I have a large family. I didn’t want to set the entire table. So, I’m showcasing my easy pastel spring tablescape on a smaller table for four. It’s just easier and I’m all about easy. But you can replicate this easy tablescape on any table, regardless of the size or shape. I used this temporary tattoo paper to create monograms for the lightly colored eggs. These also serve as place cards and I love how they turned out. I created my design over on Canva and printed them out. Remember to flip your initial before printing or it will be backward. These cute little napkin rings are also from Amazon and they are adorable! They come in four pastel colors. The spring plaid napkins are also from Amazon. I use these napkins all throughout spring and they go with so many different tablescapes. I don’t care for elaborate centerpieces unless I’m entertaining the queen and that scenario will probably never, ever happen. So, simple it is. I grabbed a small branch from a tree in the woods and spray painted it white. I gave out of spray paint right in the middle and decided to leave it as is. I like it! After the branch dried, I glued pastel colored jelly beans on with my handy, dandy, cordless glue gun I received for Christmas. Yes, it was on my list. Thanks to my son for gifting it to me and thanks to Not Just Paper and Paint for introducing me to this glue gun. It’s the bomb! I never send my dinner guests home empty-handed. These bags are too cute, right? 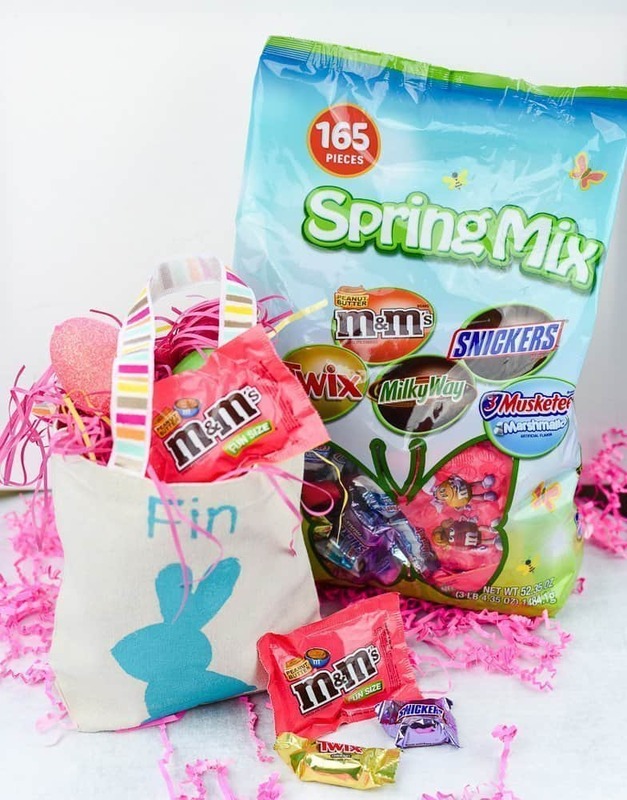 Check out this tutorial on how to personalize Easter tote bags. You use freezer paper to make your own one-time use stencil. Thanks for stopping by and checking out my pastel spring tablescape. 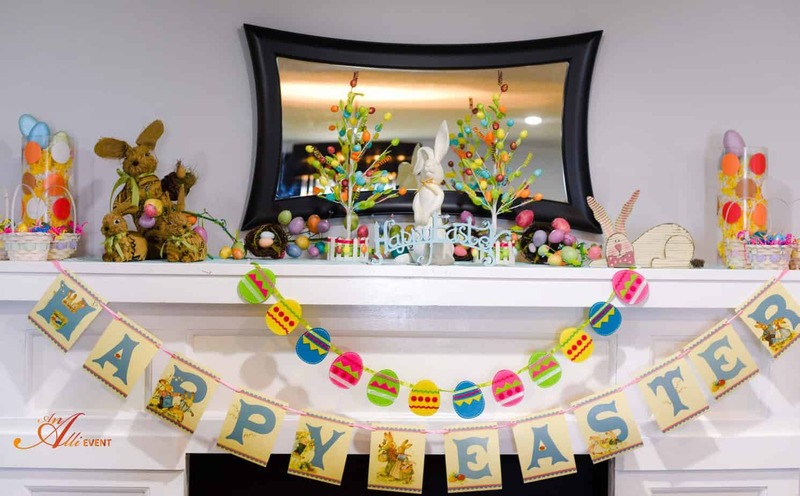 Will you be hosting Easter at your house? First of all – your table is beautiful. Secondly – your centerpiece is genius! We too love dishes and china, especially inherited from family. Your pastel table blends everything so well together and it looks fabulous. This is adorable! I love that you mixed plates from your aunt and mom with new ones – how special is that! 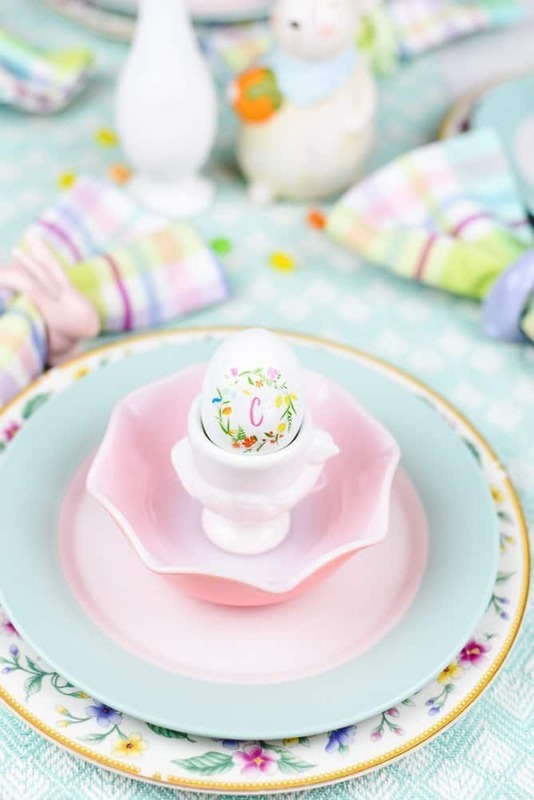 I love all the pastel colors and those adorable little egg stands! Too cute! The pastels on your table are so pretty! Love the idea of using temporary tattoos on the eggs! Genius! The pastels are absolutely lovely! And that tree branch with jelly beans is the cutest 🙂 Thanks for joining in on this hop! I love this tablescape. 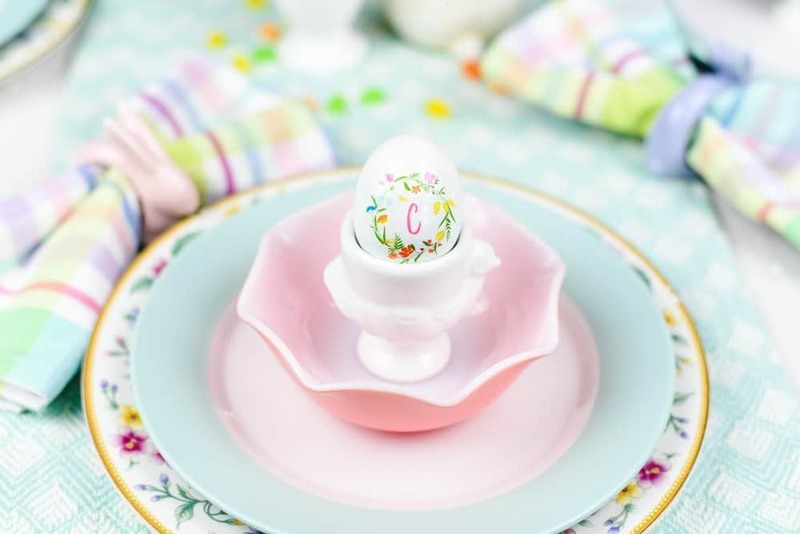 The colours are perfect and the monogram egg is beautiful. This happy tablescape is inspiring. Thank you for sharing. My Mom loved to collect dishes and had many sets. I have a set of her dishes in my cabinet now. I love your pretty pastel colors and your napkins match so well with the dishes. My grands would love to have a jelly bean tree. That is so cute. 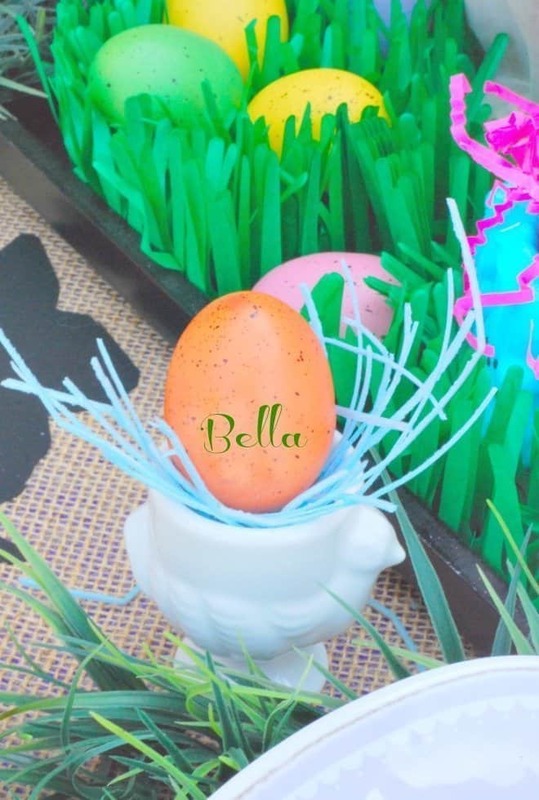 I’ll have to try your trick for monogrammed eggs! Oh my goodness Alli, I love everything about this table! I can’t believe you found so much of this on Amazon! Those plaid napkins are adorable! I always look forward to visiting your blog. You have such a talent for creative ideas and lovely style. Your pastel color palette with various textures is so inviting. The plates are so pretty. The branch with jellies is so perfect. Alli, love all the pretty pastels you used. Those floral plates are gorgeous. What a beautiful Spring Tablescape! I just love the soft pastel colors and your photos are gorgeous!